All of the riveting gameplay action of the Green Machine is back and ready for you to enjoy in Green Machine Deluxe slot machine by H5G! Even bigger special features are waiting, including fabulous free spins and five reels of symbols that you have to see to believe. Get ready to print money and find your way to easy street in Green Machine Deluxe! Value Symbols – Value Symbols appearing in any position on a played reel, with a credit value on it, awards a scatter pay. Win the sum of the displayed credit values played on all reels. Win the sum of the displayed credit values on all played reels times the bet multiplier. Free Games Bonus – During the base game, 1 Free Games Bonus symbols appearing in any position on reels starts the Free Spins. Free Spins Bonus symbol may appear with 1, 3, or 5 free spins displayed. Win the sum of the displayed free spins on all played reels. Free Spins Value Symbols appearing in any position on a played reel, with a credit value on it, awards a scatter pay. Win the sum of the displayed credit values played on all reels. Win the sum of the displayed credit values on all played reels times the bet multiplier. Free Spins uses different reels. 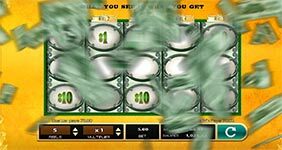 Free Spins are automatically played on the same lines at the same bet multiplier as the game that initiated the Free Spins. Jackpots – The Jackpot is available only during the base game. Landing a Mini gold bar on a played reel awards 20 times the total bet. Landing a double Minor gold bar on a played reel awards 40 times the total bet. Landing a triple Major gold bar on a played reel awards 200 times the total bet. Landing a quadruple Mega gold bar on a played reel awards 400 times the total bet. Landing a quintuple Grand gold bar on a played reel awards 1000 times the total bet. Each of the five jackpots only show on each of the five reels.